Leading Manufacturer and Exporter of Cable Terminal Ends such as Copper Ring Tongue Terminal Ends and Copper Pin Type Terminals Ends from Nashik. We are among the distinguished names in the industry, bringing forth Copper Ring Tongue Terminal Ends for our venerable customers. The offered products are manufactured using premium quality copper procured from reputed vendors. 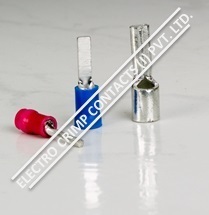 Being durable and highly resistant to corrosion, these terminal ends are highly demanded by the customers. The offered terminals are competitively priced. We are one of the leading providers of superior quality assortment of Copper Pin Type Terminal Ends, manufactured using high quality copper, these products are known for their corrosion resistance and durable quality. Our array of solder less crimping to copper aluminum conductors is designed by employing sophisticated machines and is highly durable and cost-effective. Looking for Cable Terminal Ends ?